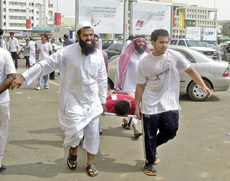 JEDDAH, 2 September 2004 — Three men were killed and 16 injured in a stampede when thousands of people rushed to claim cash vouchers at the opening of an IKEA furniture showroom at its new location near the intersection of Tahlia and Sitteen streets here yesterday. Many men, women and children fainted and some of them were trampled upon as the crowd of shoppers swelled just before the opening. The Red Crescent rushed some of the victims to the nearby King Fahd Hospital. The hospital received 19 stampede victims, of whom three died. The hospital had rushed two teams each of two doctors and two nurses to the site as soon as it received an emergency call, said Dr. Sami Badawud, a senior doctor. “I can confirm that two people were killed ... in a stampede at the IKEA store in Jeddah,” Interior Ministry spokesman Brig. Mansur Al-Turki said. “I believe that the company advertised offers that tempted customers to be there first,” said Turki. Red Crescent and hospital sources put the toll at three — two Saudis and a Yemeni. The IKEA management insisted that only two people were killed. One of the dead was identified as Zahrani, a Saudi, Amin M. Jamal, executive vice president of IKEA-Ghassan Ahmed Al Sulaiman Co. Ltd., told Arab News. Hundreds of pairs of footwear were found strewn all over the ground outside the store as people made desperate attempts to escape the stampede. The Swedish furniture showroom had mounted a big pre-opening ad campaign with the offer of SR500 vouchers to first 50 shoppers and SR100 vouchers to 200 others as part of its usual free gift scheme. Well before the opening that was set at 10 a.m., the three-meter entrance gate was opened. Several thousand people who had converged on the scene rushed forward to be among the first 50 or first 200 to claim the vouchers pushing and trampling upon each other. Thousands of men, women and children, that included many Saudi families, had started gathering at the main entrance from early morning to be ahead to claim the vouchers. “I came with my family at 6 a.m. and we were among the first to arrive there,” said Hady Al-Harthy, a middle-aged Saudi shopkeeper on Tahlia Street. He came with his wife and four children hoping each of them would collect a voucher. “But we had to return without a single voucher as we were pushed far back,” he said. Traffic had virtually come to a standstill in the peak morning hours, especially on Tahlia and Sitteen roads. “It took me more than an hour to negotiate a kilometer distance on Tahlia Road from its Madinah Road intersection,” Mohammed Abu Najar, an office executive said. The initial crowd of 20,000 swelled to many more after the opening. “Looking at the crowd, we anticipated trouble and decided to open the main entrance around 9 a.m. We kept the door slightly open, just enough for one person to enter at a time, and distributed vouchers to the first 50 and the next 200 people as per our ad campaign,” Amin Jamal said. “The trouble was outside the showroom and everything inside was smooth,” he said, adding that 16 other stampede victims were treated in various hospitals and discharged. Jamal said all security agencies had been notified in advance about the expected crowd for the store’s opening both in Jeddah and Riyadh where IKEA opened its showroom simultaneously. They included the Riyadh security authorities, the Makkah Governorate Security and the police. “Aside from our own security, there was a strong presence of patrol police, traffic police and civil defense staff outside the showroom for the opening,” Jamal said. “The Riyadh opening was without any problem, although we had made a similar offer of vouchers to shoppers. Maybe the Riyadh shoppers are more disciplined,” he said, adding that this was not the first time IKEA, known for its simple and reasonably priced products, had made special offers. “Two weeks ago we offered a 50 percent discount as a closing down offer at our old showroom in east Jeddah. We received 25,000 people and there was absolutely no problem,” Jamal said. “We’re following up with the Red Crescent to get more information on the condition of stampede victims and also with the police and civil defense authorities as to what exactly went wrong outside. On our part, we had taken all precautions and measures by deploying 50 security guards both inside and outside the showroom in addition to 100 policemen,” he added. Once the crowd gained its entry into the showroom, the scene inside was normal. The showroom also reported “excellent business” on the opening day. There were fights and fisticuffs at times as young women complained of being targeted for molestation. Youngsters had a field day as they moved in groups on the two floors of the showroom and its vast parking area on the ground and in the basement. More than 10,000 shoppers attended the opening of IKEA’s new showroom in Riyadh despite the sweltering heat in the city. A large number of security officers were present to control the crowd. Ghassan Ahmed AlSulaiman Co., the Swedish furniture giant’s Saudi agent, has invested SR240 million on the projects in Jeddah and Riyadh. Covering an area of 28,500 square meters, the IKEA center in Riyadh is located between Omar ibn Khattab Street and Prince Sultan Street. It presents more than 6,500 products under one roof. Addressing a press conference, Ghassan Ahmed Al-Suleiman, said that with the opening of the two new showrooms, the number of Saudi workers in IKEA would reach 60 percent. “We have already recruited and trained a large number of Saudis to work at the new showrooms,” he added.